By hungry runner on September 14th, 2009 . Filed under: Cupcake Ideas, Decorating, Recipes . Since it is already the middle of September, that means it is apple season. 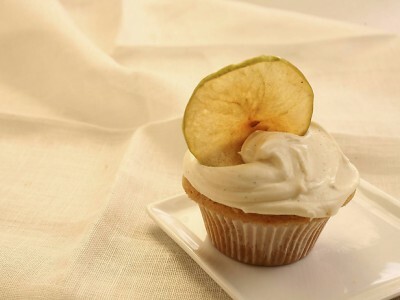 I think the perfect way to acknowledge that fall is rapidly approaching is to bake apple cupcakes. This delicious looking recipe is courtesy of Food Network. Calling for only one apple, the apple flavor comes from an additional ingredient needed, apple butter, which is piped into the center. Apple butter does not contain any dairy, the name comes from the consistency since it is so think and spreadable. It can easily be made at home or when short on time, it can be bought from most grocery stores. The cupcakes are finished with a cream cheese frosting and in the picture they are garnished with an apple sliver. That looks so good- and sounds easy. Nice to have something a bit different this time of year. mm… that looks so good…*fantasising*but too bad they dont sell the apple butter here. I saw this recipe on Food Network, too. Do you have any idea how to make the apple sliver garnish??? I have seen that garnish done with other fruit, too, but I have no idea how to make it. It doesn’t really looked candied. And, I don’t think it’s just dried, either…because it doesn’t look like a dried apple. If you know how to make the garnish, could you please share the technique with me? Yuuki-click on the words “apple butter” its a description of how to make your own! Jeff-I found these instructions after a quick google search “It’s an apple chip. Easiest thing in the world! Preheat your oven to 200*F and line a baking sheet with parchment paper. i have not made them but i am looking forward to be.